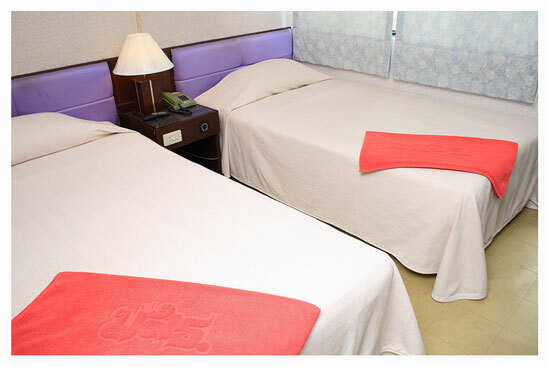 STOU offers a variety of accommodation options for event participants and special guests. One of the main buildings at STOU used to host outside conferences. The variety of meeting spaces and convenient accommodation in this building and the connected Seminar Building 2 make this location well-suited to hosting academic conferences. Seminar Building 1 has 57 standard rooms and one suite. Connected to Seminar Building 1, Seminar Building 2 is equally suitable for hosting participants in a conference or seminar. In this building, there are 83 standard rooms and 2 suites. 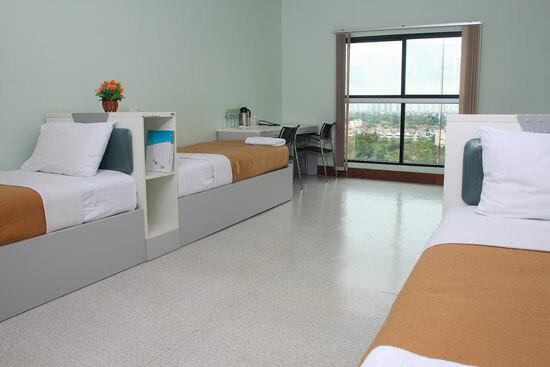 Accommodations in the Phithayaphat Building are primarily used for students when they come for special training courses or other seminars at the STOU campus. 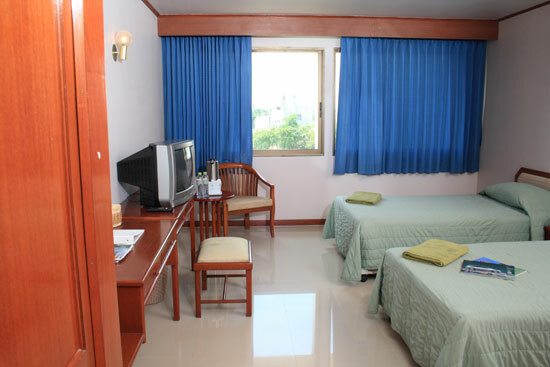 However, if the rooms are available, special arrangements can be made to rent these facilities. 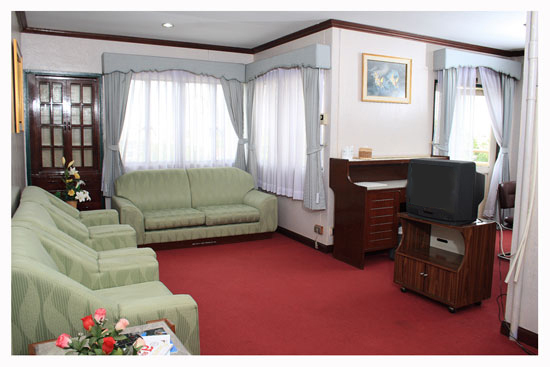 There are a total of seven double rooms and 82 rooms with four beds. 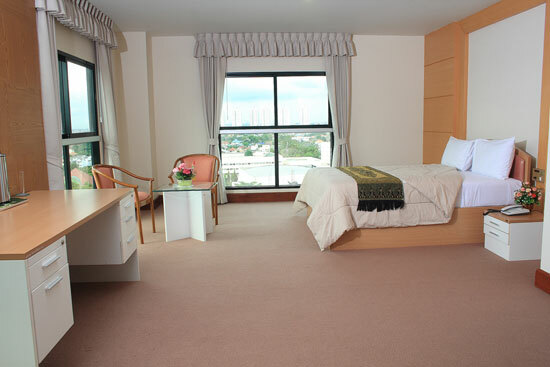 The rooms at the Chaloemphrakiat Building are also typically used for visiting student accommodations. 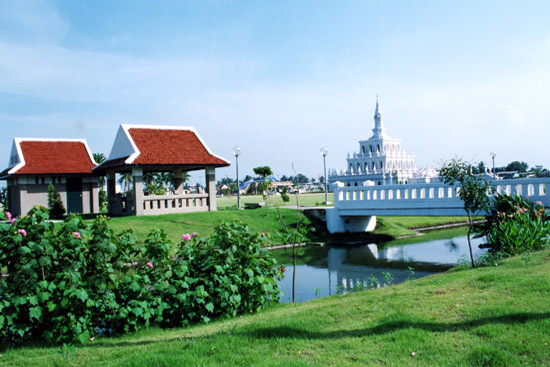 As with the Phithayaphat Building, outside groups may also be able to arrange for lodging at the conference center. 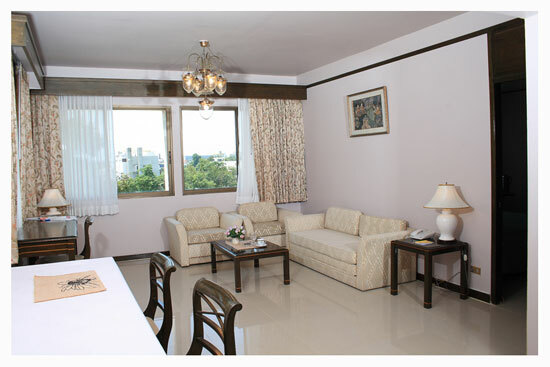 This building has 147 large four-bed rooms, as well as 27 standard rooms. Extra Bed available for large room. Please note that none of the accommodations on campus includes breakfast, so conference organizers may wish to arrange for breakfast with STOU catering services. Guests may also eat at the Parichat cafeteria on campus or at the many food stands and restaurants near the university. Guests who enjoy walking or jogging are invited to take advantage of the Rajamungkhalaphisek Educational Park, which is part of the STOU campus. Guests are also welcome to use the Sukhosamoson Staff Club on the STOU campus. 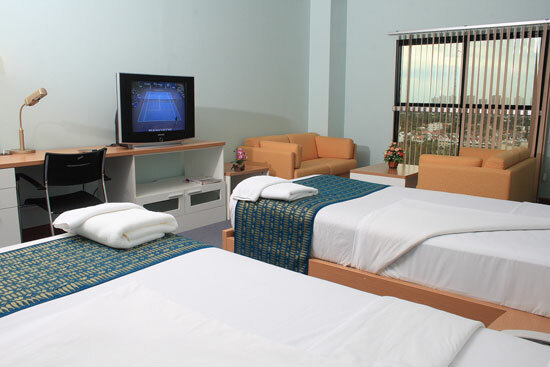 This facility includes a swimming pool, gymnasium, tennis courts and badminton courts. 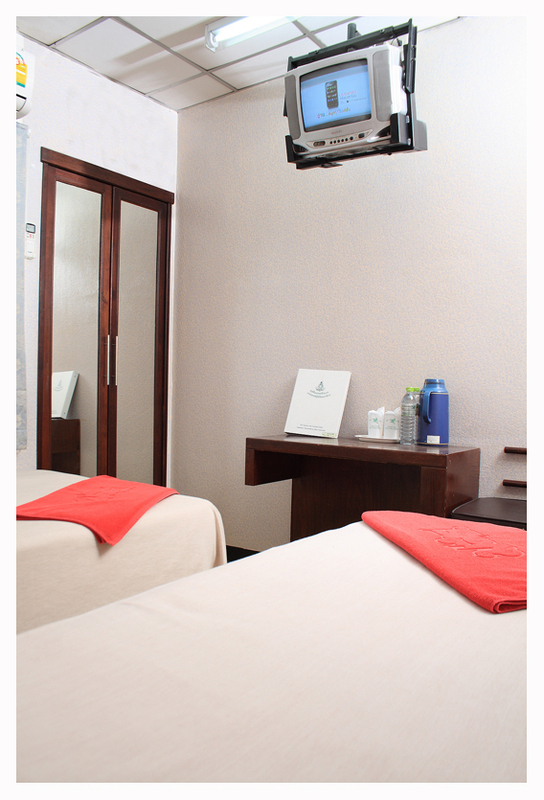 Yoga classes are also held at the club, and interested guests may make private arrangements with the instructors. Guests may also be interested in events at the nearby IMPACT Arena, Exhibition and Convention Center. To get there, wait in front of the university for a songthaew (modified pickup truck) marked with a large number 1. When you see the large blue sign that says “IMPACT” on the left side of the road, ring the buzzer to stop and pay the driver before entering the IMPACT grounds. Check the schedule of current and upcoming events at IMPACT. Walk to the bus stop across the street from the main entrance of the university, and wait for bus number 166. After taking your seat, tell the fare collector you want to go to Victory Monument (Thai: Anusawari Chai). As Victory Monument is one of the transportation hubs in Bangkok, from there you may take a taxi, another bus, or walk to the opposite side (the southernmost end) of the traffic circle to get to the BTS Skytrain station. The BTS goes to several popular destinations in Bangkok, including one spur that crosses the Chao Phraya River. 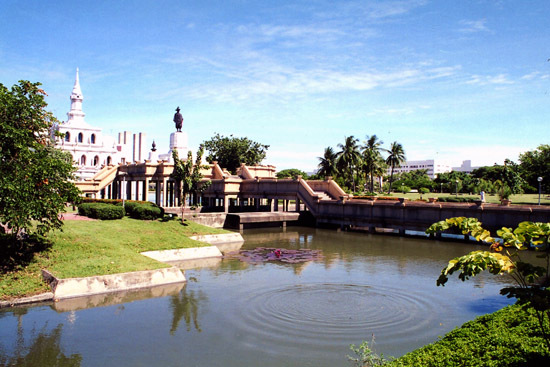 From the river (Saphan Taksin station), it is possible to access the old district of Bangkok (Phra Nakhon district) via a regular express boat service. Note: The 166 bus returning to STOU alternates between driving all the way to STOU and just passing the turnoff to the university. Make sure the fare collector knows that you are going to Sukhothai Thammathirat (you can also give the Thai abbreviation: “mo so to”). You will either be taken all the way to STOU, or you will be directed to get off the bus on Chaengwattana Road at the cross-road that goes to STOU. If this happens, cross Chaengwattana, then take a motorcycle taxi back to the university. Alternatively, wait for a white “songthaew”(modified pickup truck) with a large numeral on the front. Tell the driver your destination before you board, and they will stop at the university gate. 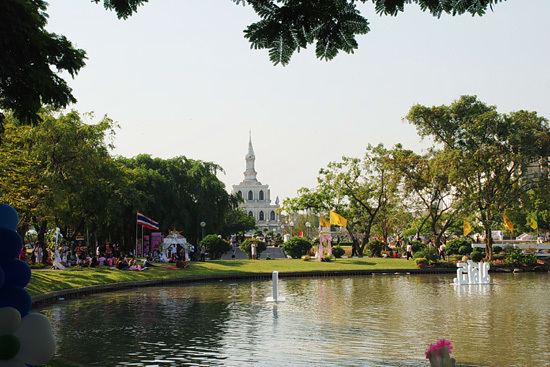 There are many things to do in Bangkok: visiting temples, parks, markets, shopping malls, museums, or simply taking in the hum of activity along the city’s bustling streets and lanes. Visitors to Bangkok are encouraged to consult guidebooks and internet resources to decide which places interest them the most. 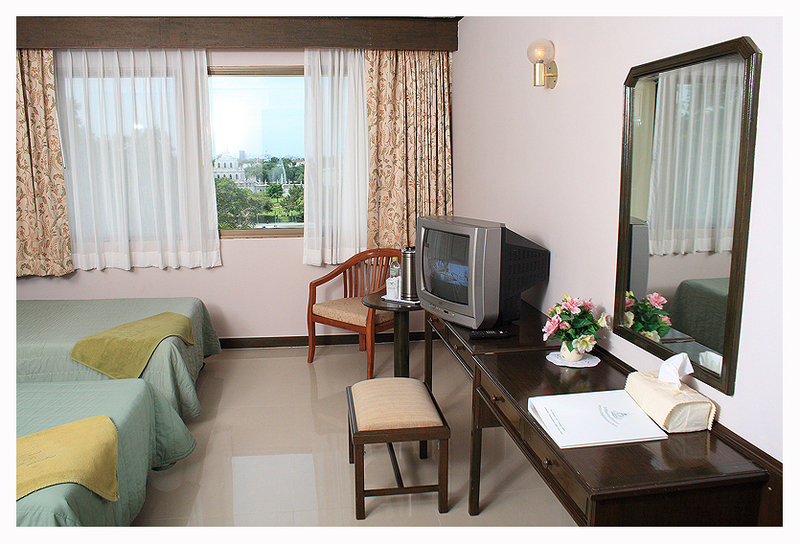 Guests traveling into Bangkok should take the STOU address with them in English and Thai.